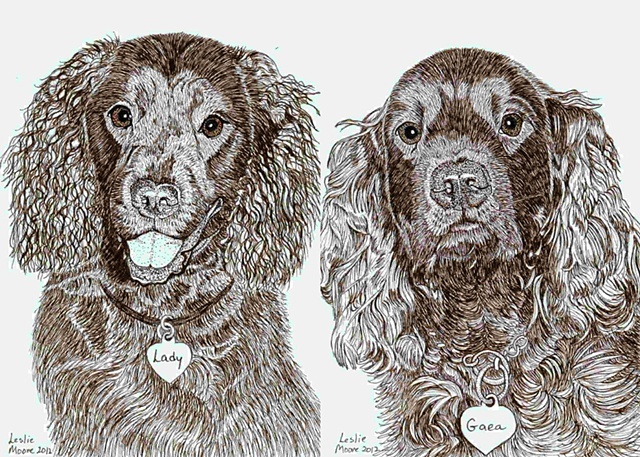 I’ve been drawing a series of American Water Spaniels for Mary Kangas, a long-time breeder of these unique dogs (Noma's American Water Spaniels). Lady and Gaea are numbers six and seven. I have at least ten more portraits to go before I’ve drawn every single AWS Mary has owned. One might think that all spaniels look alike. Wrong! Lady and Gaea represent two different AWS types. Lady has a retriever head, while Gaea has a spaniel head. Lady’s fur is tightly curled and she has shorter ears. Gaea is called a Marcelle. Her fur is loosely curled and she has longer ears. I’m learning a lot about these dogs as I draw them. Thank you. Both girls are beautiful. We know exactly which girl is which without looking at the name tags. You have captured them perfectly.